I really liked last week's floral manicure so I decided to take another go at it. This time I did a gold slanted tip with a single flower. I used China Glaze White Cap layered over a base of Sally Hansen Complete Salon Manicure Lavender Cloud. 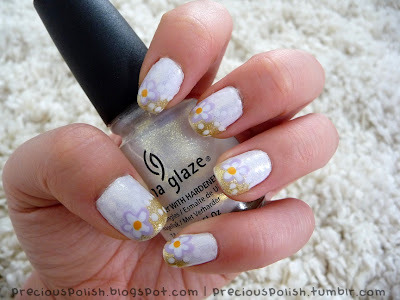 China Glaze 5 Golden Rings was used for the tips and the flowers were made with Essie Lilacism, American Apparel Manila and more Lavender Cloud.